I'm back in the cold, snowy Midwest this morning, savoring the memories of my recent trip. 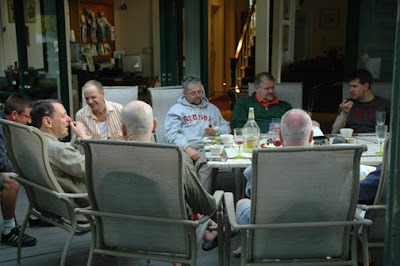 The trip has become a tradition, as we have been visiting the Keys at this time of year for a decade now. One of my favorite parts continues to be the ride down. 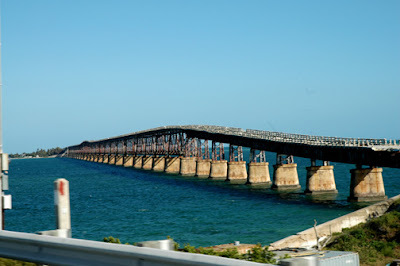 Rather than opting to fly from Miami, we rent a car and drive down the Overseas Highway. 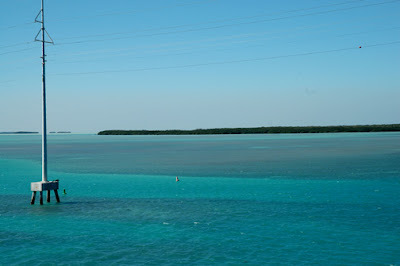 There are two routes from the mainland onto the Keys. We almost never opt for US 1, preferring the charm of Card Sound Road. The road takes you through a fairly degraded section of the Everglades (lots of invasive Australian pine (Casuarina equisetifolia) and Brazilian Pepper (Schinus terebinthifolius). But soon enough, you come to Card Sound Bridge and the amazingly blue waters of the sound. Suddenly, you're on Key Largo. Key Largo is both my most and least favorite of the Keys. The west end is very developed with T-Shirt and dive shops, hotels, and fast food restaurants. It always reminds me of Route 28 on Cape Cod. 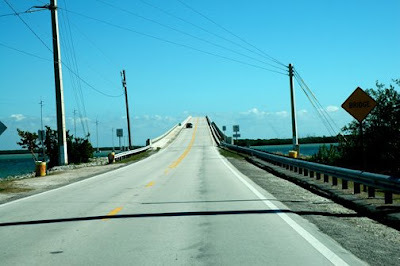 Card Sound Road dumps you off onto the east end of the Key, however, for the pleasure of driving through 10 miles of nearly pristine hardwood hammock, the finest remaining stand in the Keys. It's a glimpse of what the island chain looked like before it was developed. 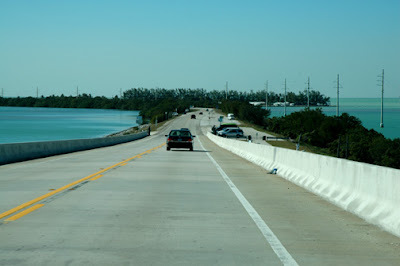 West of Key Largo, the road slips into a familiar rhythm: island, channel, island, channel. Signs post the names of each Key and we read them off like the litany of saints: Plantation Key, Upper Matecumbey Key, Grassy Key. The parallel lines of power cables and Mr Flagler's Overseas Railroad are constant companions as we head ever westward. 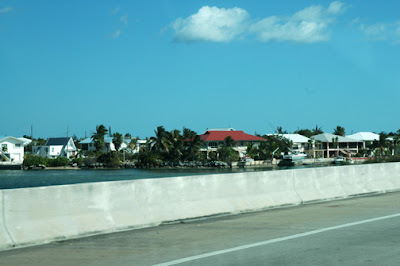 We see vacation homes and people fishing from the bridges. The many seabirds include terns, gulls, pelicans and cormorants. If we are lucky, we see a frigate bird soaring overhead (no luck with that on this trip). Sections of the bridge near the shorelines have been knocked down, keeping folks off of the main span. 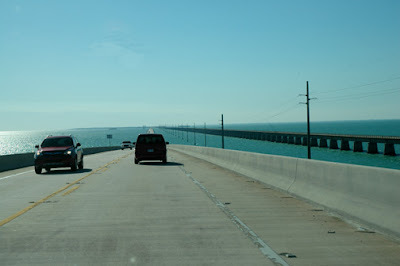 The trip is punctuated by the Seven Mile Bridge just west of the town of Marathon. 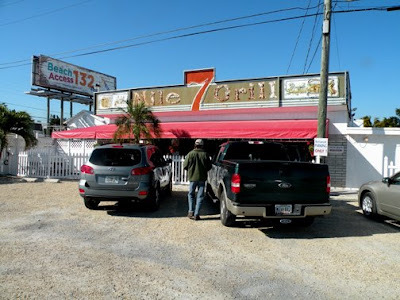 This year we stopped just before crossing at the Seven Mile Grill, a restaurant that several folks have recommended to us. Their grouper sandwich was amazing. 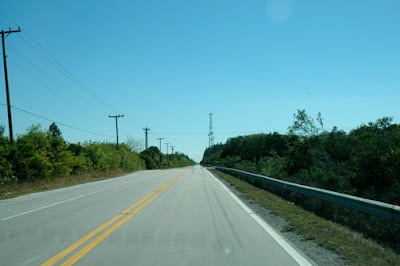 Traveling Overseas Highway always gets me more fully into holiday mode. The journey represents a departure from the mainland, but also a departure from the cares of life back home. I always fell a strong sense of the freedom of the open road when I drive it, heightened by awareness that we will be greeted at the end by good friends that we do not see often enough. Note: I do the driving on this trip. With the exception of the Key Largo Hammock and Seven Mile Grill pictures, all of the photos in this post are Leon's. I hear it is in the 80s right now in the Keys. Just LOOK at the size of that bottle of wine! Pictures are fab, thanks for the tour! Spo- The weather was much nicer after everyone else went home. Heather- Goodness, girl what are you thinking. That isn't a wine bottle. (Well, OK, it's margaritas).